Since TransLink has no money to expand transit service in any meaningful way, for every new bus route or increase in service along one route, another route has to have its service reduced or eliminated. TransLink is proposing some major changes to transit service for the South of Fraser in the coming year. For every enhancement made to the South of Fraser network, service was reduced elsewhere. These proposed changes are outlined in the September 25, 2015 Open Board Meeting Reports. For example if TransLink moves forward with its plans in Langley City and Brookswood, the 590 and 502 Brookswood services will be eliminated. I’m actually losing access to the 502 right next to where I live; this will increase my commute time in the morning. Update: People in Brookswood will have to take the 531 or C63, then transfer at Langley Centre. TransLink is proposing to loop the 531 thru the Langley Centre bus exchange. This will actually improve access for people heading toward Campbell Heights Business Park and South Surrey/White Rock. 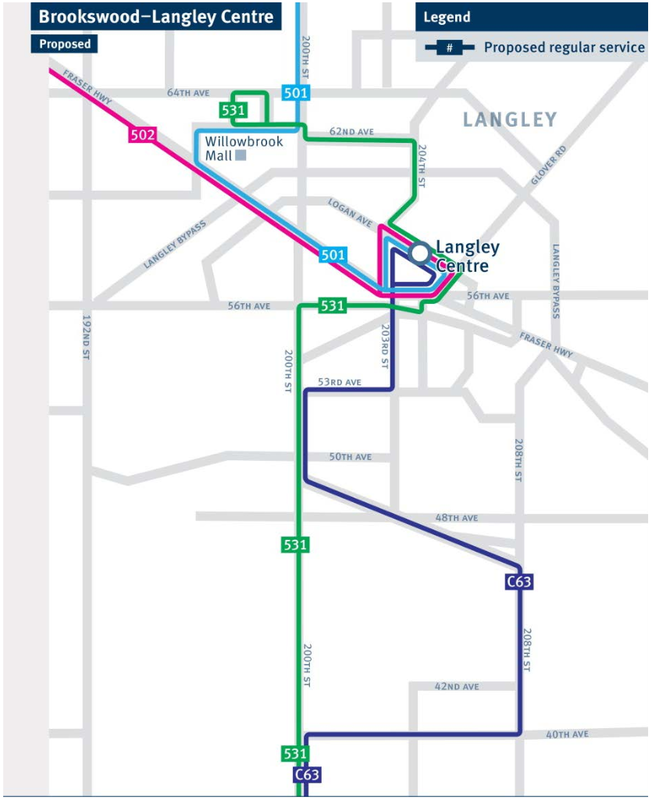 Proposed changes to 502/590 in Langley City and Brookswood. Select map to enlarge. 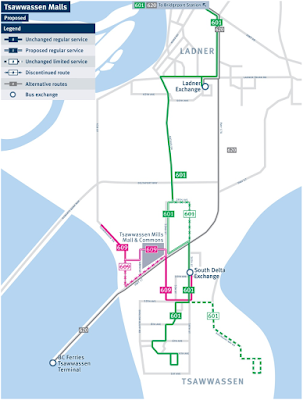 TransLink is also proposing to move the 595 route from 200th Street to 208th Street. This proposed change will finally give people in Willoughby better access to transit services. It will be interesting to see if these routes will stay running every 30 minutes with higher frequent during peak hours, or if one of the routes might be upgraded to be part of the frequent transit network. Proposed change to move 595 from 200th Street to 208th Street in Langley. Select map to enlarge. 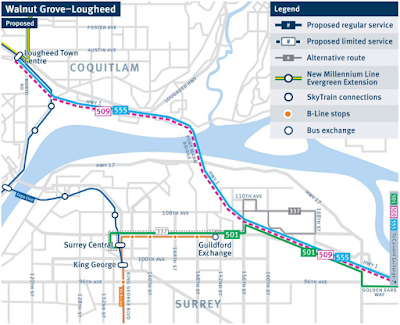 TransLink is also proposing to move the 509 service which serves Walnut Grove. Instead of accessing the SkyTrain system via Surrey Central, it will now be thru Lougheed Town Centre. Proposed change to 509 bus route to Walnut Grove. Select map to enlarge. In Tsawwassen, TransLink is proposing to tweak transit service to provide service to the new Tsawwassen First Nations mega malls. Proposed changes in Tsawwassen due to new mega malls. Select map to enlarge. In Cloverdale and Newton, the 341 service will now only go between Newton Exchange and Guildford Exchange. 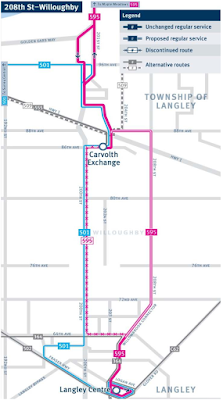 A new Highway 10 bus route is being proposed in places of 341 service that used to travel between Newton Exchange and Langley City. 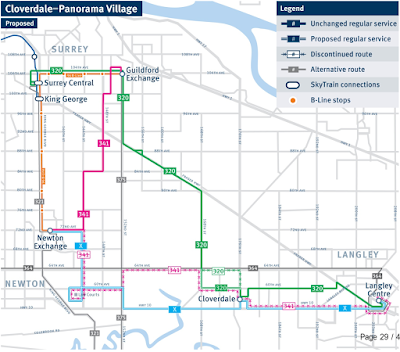 Proposed changes to 341 in Surrey, plus new Highway 10 bus route. Select map to enlarge. The 394 service which travels between King George and White Rock today as a peak hours-only service will be changed into a more B-Line-like service, though it will still only run during peak hours. Finally, TransLink is proposing two possible options for service "optimization" in South Surrey/White Rock. Proposed changes to bus service in South Surrey/White Rock. Select map to enlarge. Unfortunately with no new money for transit in our region, when one area gets better transit service, another area gets worse transit service. You can see this in TransLink's proposed changes for transit in the South of Fraser. This is expected but still disappointing. Considering I use the 341 from Cloverdale on a regular basis, I'm just left wondering if the service frequency will be maintained; however, if they are separating the routes instead of rerouting them, that leads me to believe service frequency of that route through Cloverdale will be reduced. 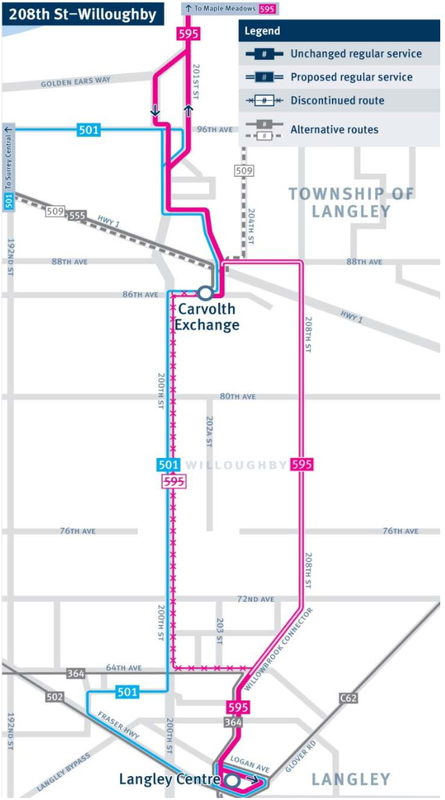 I'd like to see an express bus service like the 555 from Carvolth to Ladner/Tswassen along Hwy 17 including Scott Rd skytrain. Then the FVX would be useful to me. 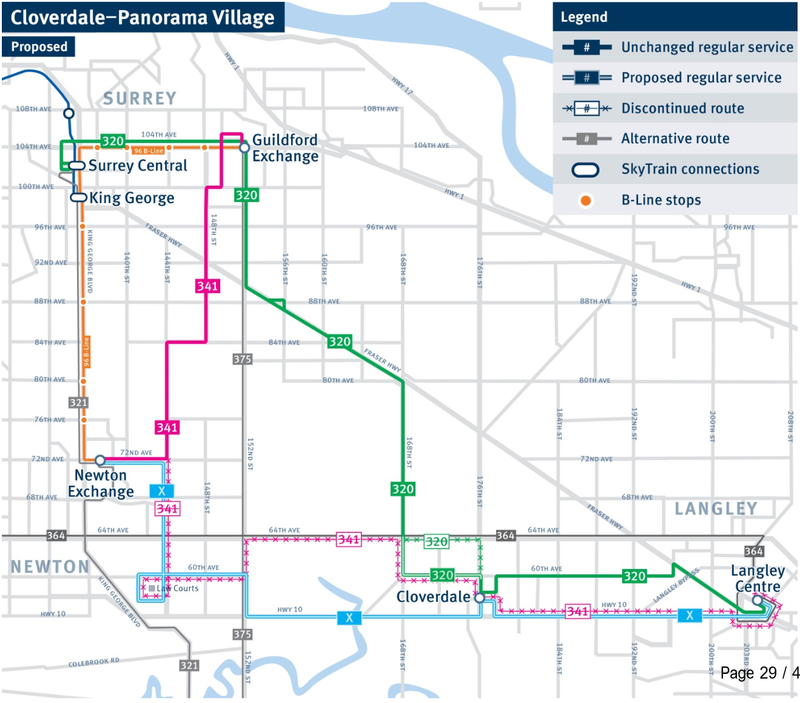 As a frequent transit user and resident in the Grandview Heights area, the 2nd proposed plan in South Surrey is quite ideal as it allows for more transit access in the Grandview Heights/Morgan area. Currently, the only bus that runs in the area is the 531, which comes every half hour in both directions. Although efficient, this route can be quite unreliable, as it arrives extremely early or late at times, leaving you stranded and having to wait for another half hour for the next bus. Sometimes the bus doesn't even show up at all. 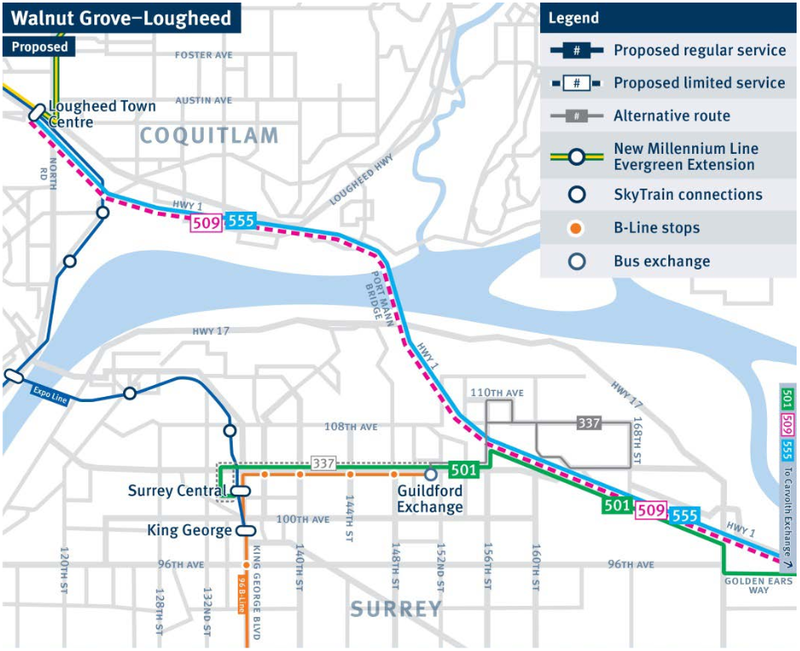 Having the 354 come to Grandview would make direct transit to the skytrain and downtown a breeze and give access to other buses without having to take the 531 to 152nd street and waiting for the next bus. 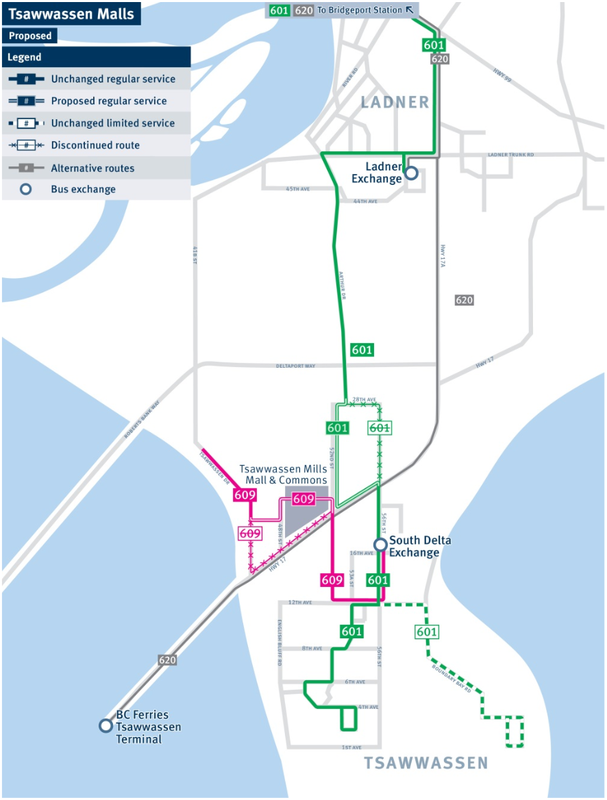 Also simplifying the C53 route is necessary, as the current long and draggy route takes a whopping 45 minutes just to get from Grandview to White Rock Centre; a trip that should take only 10-15 minutes at maximum. Lastly, having a bus down the steep hill of 160 street and down 32nd is extremely useful as accessing transit from there is difficult since its quite far from the buses on 152nd and to high of a slope to walk up 160th and catch the bus up there. In conclusion, I believe that this proposal would bring a positive change in the Grandview Heights/Morgan Crossing community.